Back at PC Zone magazine, where I was born out of an egg, it was my job to take the raw copy submitted by our freelance writers, strip out most of the sexism and veiled threats against politicians, and produce a polished and well structured review that was legally fit for publication. One of the most commonly deleted and cliched introductions to any game about a war (which was almost every game back then) went as thus. “War, huh? What is it good for? Well, this game for a start.” If you’ve never read those words in that order before, send a thank you card to your nearest editor today. I can still picture the freelancer’s wide-eyes and self-satisfied grin as they smashed the enter key, confident that they had just invented a cool and original way to begin a review about wars. Bam! Now there’s an opening line, they would say, half laughing to themselves in disbelief that the very first thought that occured to them could be so brilliant, so perfect. Then they would lean back in their chair and run their hands through their hair like Christian Bale having just done a murder. I know this because I was that writer, once. Asking what war is good for and then saying it’s the game you’re writing about is a rite of passage for any games journalist, like finding out that you’re not allowed to use the words ‘gameplay’ or ‘visceral’, even when you’re talking about guts spilling out. But that being said, war! Huh? How about that war? It’s okay right? Everyone loves a bit of a war, with all of those war people charging into one another, bludgeoning each other to death in an unstoppable maelstrom of injury and violence. War is excellent, and I’ll tell you what it’s good for actually. 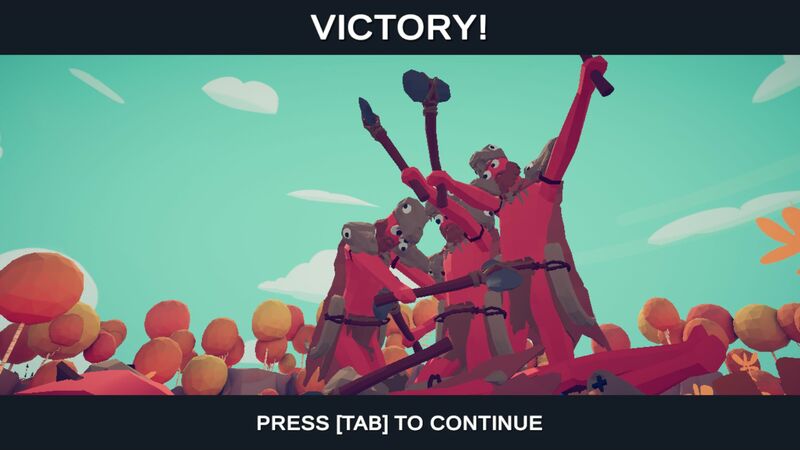 Totally Accurate Battle Simulator. It’s a wonky physics-based pile-on simulator in which you lay down an army of units and set them off to do battle with the enemy in super short skirmishes. If your Twitter timeline is anything like mine, you’ll have already seen endless gifs of various units facing off against one another: archers versus spearmen, swordsmen versus flying Valkyries, a couple of vikings carrying a longboat on their shoulders versus a wooly mammoth. It’s rock paper scissors with a few dozen more iterations, with units drawn from a set of categories from fantasy, history and beyond. You’re presented with a strategic aerial view of the battlefield, the enemy formation already in place on the right hand side of the screen, and tasked with placing units on the other half using the limited currency at your disposal. There are some expensive, superpowered fighters – the actual Zeus, long-range catapults, and crow-flinging scarecrows are all pricey enough that often you can’t use them – and some low-level weaklings whose strength usually lies in their numbers. Will an army of 80 hobbits overpower a pair of stone mages? 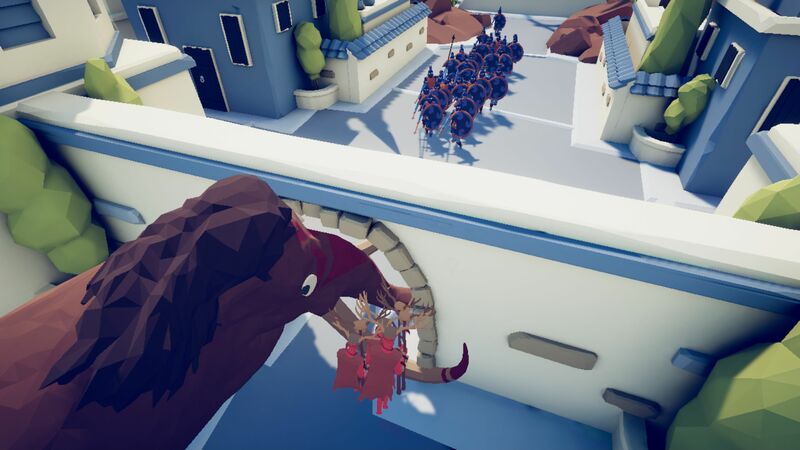 Can a single minotaur destroy a dozen archers who use snakes instead of arrows? It’s Total War meets the childhood-slash-stoner argument of ‘Who Would Win In a Fight Between’. Hit the start button and you’ll find out quickly enough, the physics engine clattering into life as your spawned army noodles its way across the arena like haunted marionettes, haphazardly swinging and slashing like they’re a bunch of Deus Ex: Infinity War era ragdolls. It’s a mad circus of limbs. Corpses pile up, bodies are sent hurtling through the air, guys in wheelbarrows sprint over cliff edges, and it’s all set to pained screams that somebody has clearly recorded in their bedroom. At some stage in development it was decided that every soldier would have a pair of ridiculous googly eyes, and to be honest it’s that dumb little detail that makes the carnage so stupidly fun to watch unfold. Battles are swift, and usually over in less than a minute. If your selection of fighters isn’t up to the task, you can clear the board in a single click and try with an entirely different set of recruits, or tweak the setup you’ve already got, but in practice there’s very little strategy to unpick here. Fights are over with so quickly that it’s fun to just experiment with the units at your disposal, laying down a thick cavalry of cheap squires or piling all of your currency into one lighting-bolt chucking demigod, just to see what happens. 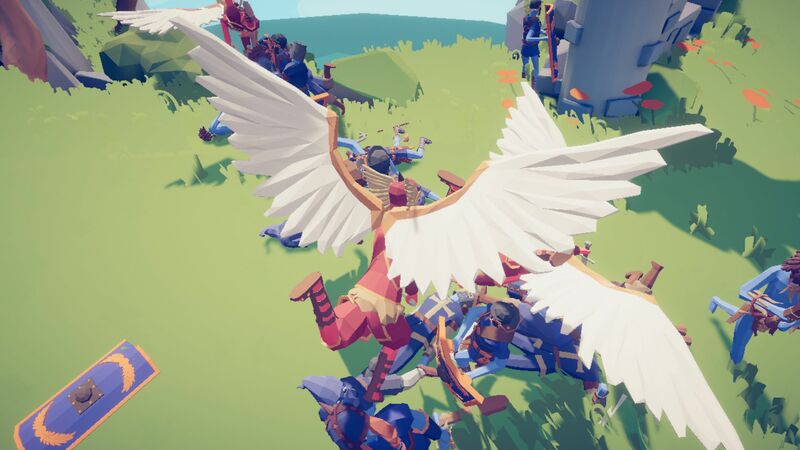 The early access version of game feels barebones, but has the makings of a campaign, which for now comprises a series of head-to-head battles against enemy armies of different types and configurations. Sometimes they’ll be bale-armoured farmers hiding in fields, or shielded mages spilling out of the mouth of a cave. There’s also a series of tutorial battles that introduce each of the factions in turn, from the prehistoric and medieval through to Roman and Viking units. And then there’s a challenge mode, which is very similar to the other two except a little trickier, with some more cunning enemy unit placements to outwit. You’ll finish most of the missions in a few hours, but progressing through them isn’t the objective of the game. Totally Accurate Battle Simulator has the depth and longevity of a desk toy, but also the appeal of a desk toy, inviting you to fidget and experiment with its flailing silliness over and over again, and calling you back to it when you’re bored of whatever else it is you do at your PC that’s so important. Totally Accurate Battle Simulator is utterly pointless, but great, a futile waste of time that is still primally entertaining for anyone who’s watching, just like war, or masturbation, or reruns of Friends. Steve began writing about games just like everybody else did, by wandering into a cave and touching the cursed egg. He wrote for PC Zone magazine until it closed, and spent the next eight years confused and roaming the streets, shouting his reviews of Sims expansions through letterboxes on foggy nights.